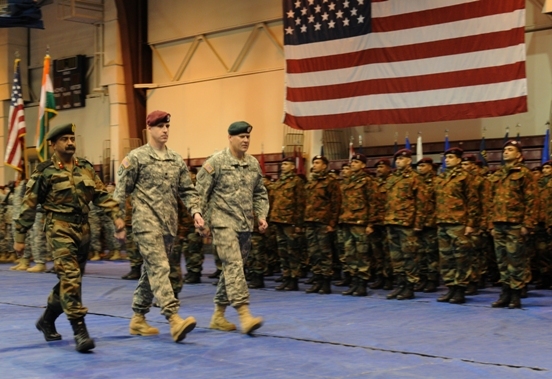 Indian Army and US Army senior leaders conduct a troop inspection during the Yudh Abhyas 2010 opening ceremony of the annual joint and bilateral training exercise Oct. 31 at Buckner Physical Fitness Center, Joint Base Elmendorf-Richardson, Alaska. Photo: US Army. 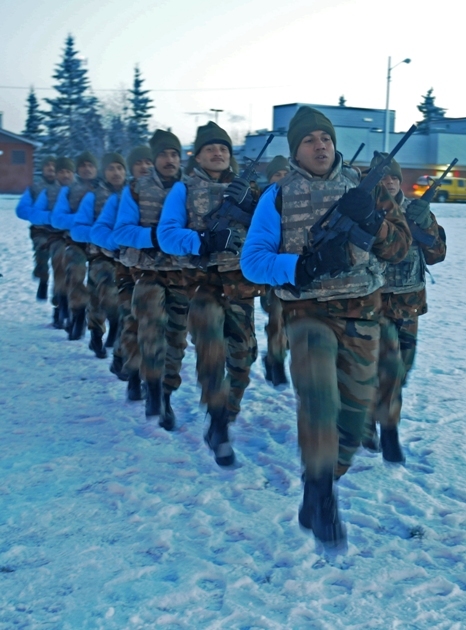 Indian Army soldiers march in front of an audience to explain their team�s role during cordon and search for a training demonstration during US Army Alaska and Indian army combined raid training at the Education Center on Joint Base Elmendorf-Richardson Nov. 5. Photo: US Army. 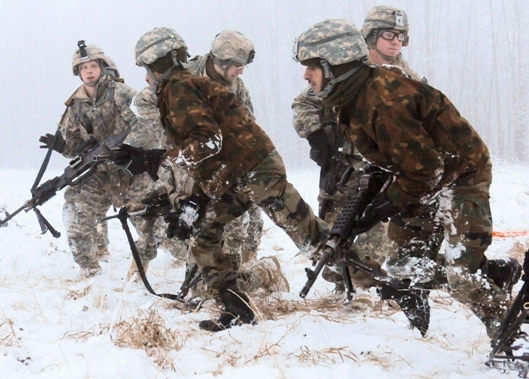 Indian Army soldiers set perimeter and move as part of specified teams during a cordon-and-search demonstration during US Army Alaska and Indian army combined raid training at the Education Center on Joint Base Elmendorf-Richardson Nov. 5. Photo: US Army. 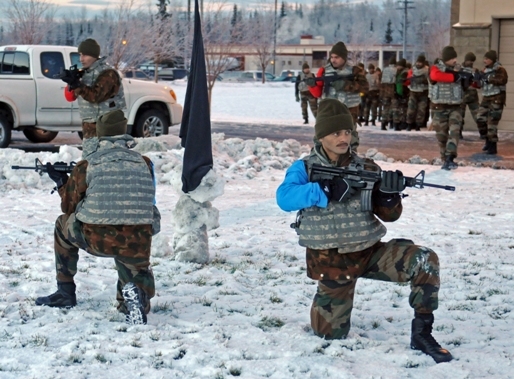 Indian Army soldiers guard a hostage for a cordon-and-search demonstration during a US Army Alaska and Indian Army combined raid training at the Education Center on Joint Base Elmendorf-Richardson Nov. 5. Photo: US Army. 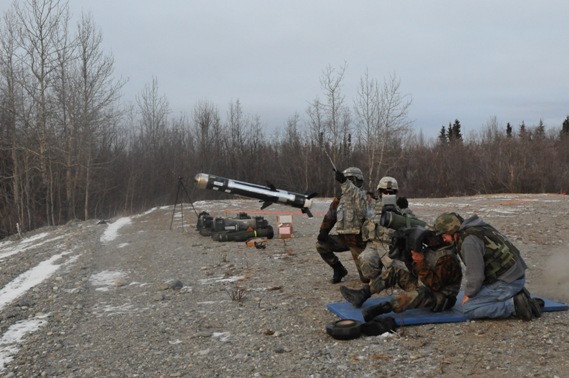 A soldier from the Indian Army fires the Javelin anti-tank missile Nov. 8 during Yudh Abhyas 2010. Photo: US Army. 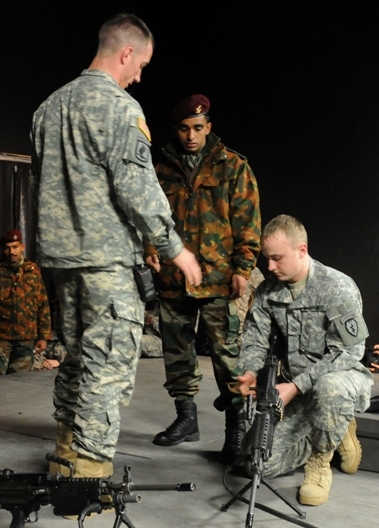 A US Army soldier instruct Indian soldiers on loading the M-249 light machine gun during their first day of joint training for Yudh Abhyas 2010 Nov. 1 at the Battle Command Training Center and Education Center on Joint Base Elmendorf-Richardson, Alaska. Photo: US Army. 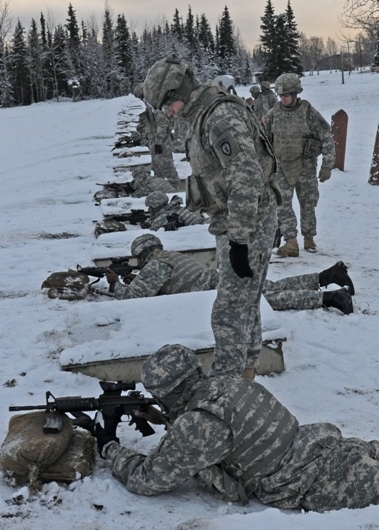 A US Army soldier assisting Indian Army soldiers during small arms training at Joint Base Elmendorf-Richardson, Alaska, as part of the bilateral training exercise Yudh Abhyas 2010. Photo: US Army. 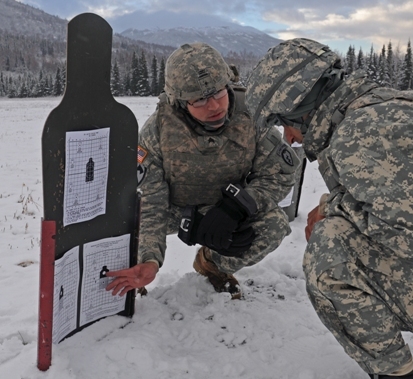 A US Army soldier explains to an Indian Army soldier how to tighten his shot-group during small arms training at Joint Base Elmendorf-Richardson, Alaska. Photo: US Army. US Army Alaska and Indian Army soldiers set up security around a simulated Black Hawk helicopter during a static loading rehearsal. Photo: US Army. 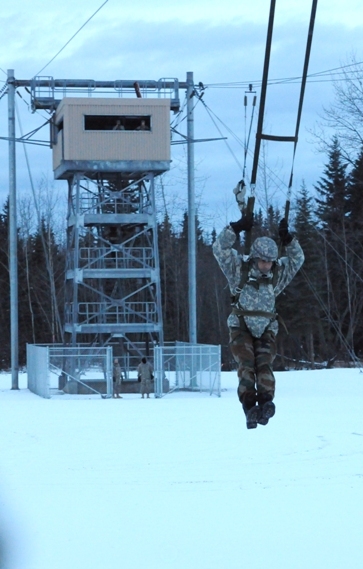 An Indian Army soldier practices US Army exiting techniques after jumping out of a 34-foot tower on a zip-line during basic airborne refresher training. Photo: US Army. 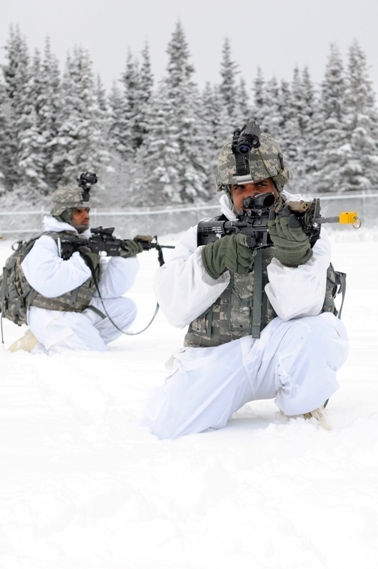 Indian Army soldiers pull security during training on US Army troop leading procedures at Forward Operating Base Sparta on Joint Base Elmendorf-Richardson, Alaska, Nov. 8. Photo: US Army. 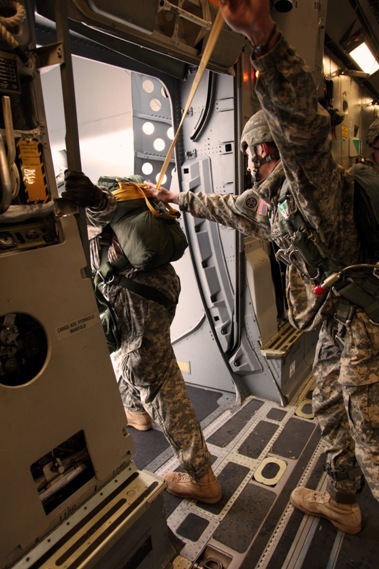 A US Army soldier assists the jump master inspect the C-17 aircraft door in preparation for a combined parachute jump between US and Indian Army soldiers Nov. 10. Photo: US Army. 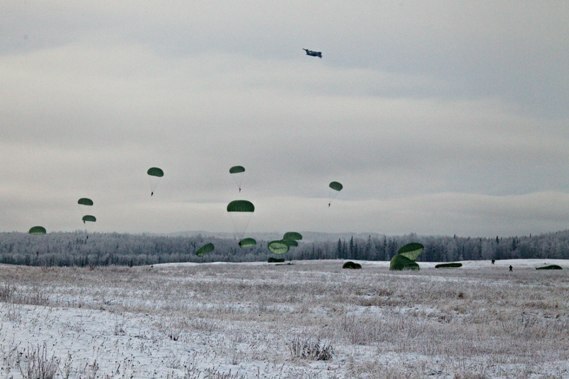 Soldiers from US Army Alaska and the Indian Army jump from a C-17 Nov. 10 during a combined airborne jump that landed them at Malamute drop-zone Joint Base Elmendorf-Richardson. Photo: US Army. 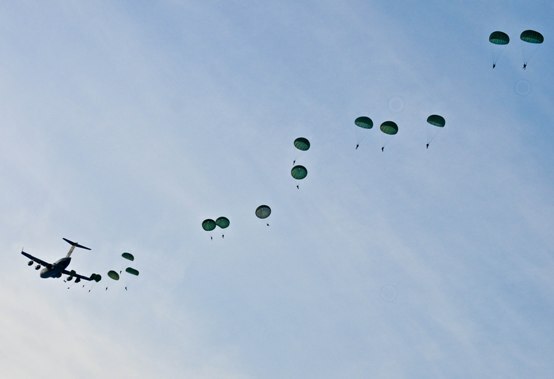 Soldiers from US Army Alaska and the Indian Army float over Malamute drop-zone Joint Base Elmendorf-Richardson after conducting a combined airborne jump Nov. 10 that included almost 400 soldiers from both armies. Photo: US Army. 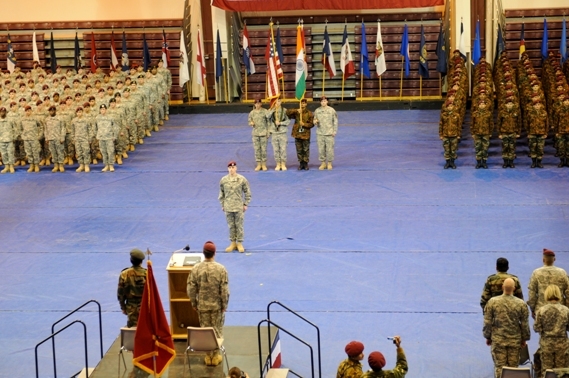 Soldiers of Indian Army and the US Army Alaska sing the US and India army songs during the Nov. 14 closing ceremony of combined training exercise Yudh Abhyas 2010 at Buckner Physical Fitness Center on Joint Base Elmendorf-Richardson. Photo: US Army.